The EOSDIS Update - Fall 2018 Quarterly Newsletter is now online! Find EOSDIS data set and data tool news, top stories, featured data images, webinars, data recipes, and data user profiles. We are pleased to announce the Fall 2018 edition of the EOSDIS Update quarterly newsletter! The Fall 2018 edition of EOSDIS Update is now available! 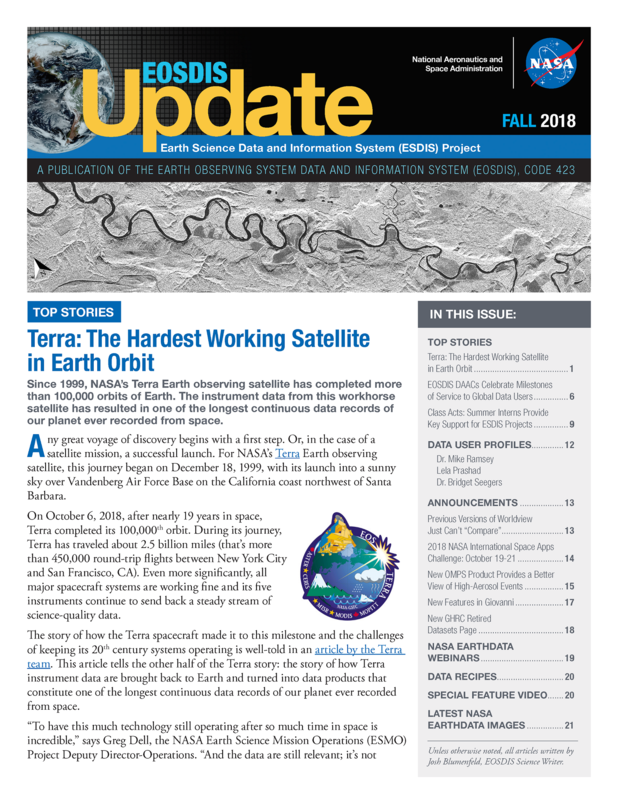 This quarterly newsletter highlights how NASA Earth science data are acquired, processed, and distributed, and features recent EOSDIS activities and achievements in bringing these data to you. In this issue you’ll learn how data from NASA’s landmark Terra mission gets from satellite to DAAC. You’ll also learn more about EOSDIS DAACs and how they serve global data users. As always, you’ll find links to Data User Profiles, webinars, and, of course, amazing images of Earth.